Red Raven records were cardboard children's records produced in the 1950's with the animation printed right onto the disc itself (later versions like the one above had the animation on the label of regular colored vinyl). The Red Raven included a little mirrored device that you pop onto the turntable's spindle that reflected the animation in such a way that while the record plays you get to see a little cartoon. Another 200+ WWII propaganda posters and comics were just added to the gallery. Don't forget to spread the word about Dieselpunks! Remember... when you browse alone, you browse with Hitler. Recently, Wired published a really good article by Senior editor Robert Capps that made me want to throw up and cry at the same time. Sam Van Olffen is truly an icon in the dieselpunk and steampunk art communities. This self-taught DJ of pictures burst onto the scene with the first wave of steampunks and has pushed the envelope with his graphic samplings ever since. The US Army this week showed off its latest high-tech blimp laden with powerful radar systems capable of detecting incoming threats 340 miles away. The helium-filled blimps or aerostats are designed to hover over war zones or high-security areas and be on guard for incoming missiles or other threats. The Army wants them to reduce some of the need manned and unmanned reconnaissance flights. Because its been a long week of programming and I need a break, I now present you with a 1940's Western... acted entirely by monkeys. I'm going to be working on the website architecture this week. If you've been playing in the sandbox, you may have noticed the upgrades to the photo gallery software. Not only has the size limit of each gallery been drastically expanded, but the photo upload tools have been streamlined, especially if you're already used to other photo websites like Flickr and SnapFish. Wish Lord K a happy birthday! The war creeps from the blooded hearts of evil men across the borders of Europe. Tanks roar across the land in lightning warfare. Planes thunder through the clouds, heavy with destruction. And men cry out in the trenches, praying for an end while turning round after round through freshly stamped automatic rifles. The year is 1942, and the world is at war. H.G. 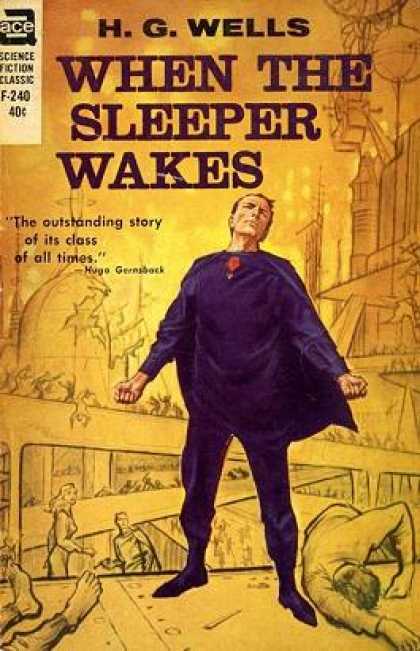 Wells - When the Sleeper Wakes (1910) aka "The Sleeper Awakes"
What a week, Dieselpunks! We've seen Earthlings attacked by men from Mars, men from the Moon, and men from THE FUTURE, all captured by the imagination of Victorian genius, H.G. Wells. This week long tribute to Mr. Wells ends with a lessor known work, but one that has a plot close to the heart of punks everywhere. It's so hard to pick a proper vehicle to carry H.G.Wells' heritage. The author of 'Time Machine' started his way to eternity in Vernesque era and left this Universe in the most dystopian days of Dieselpunk period when most of his prophecies came true. So, his life is a kind of a bridge between two epochs. Singer. Songwriter. Woman from the past. Dances of Vice performer. I couldn't let "The War of the Worlds" pass without posting about its influence on Hollywood over the years. While the setting has been updated each time, the general concept of a devastating alien invasion lives on. The War of the Worlds (1898), by H. G. Wells, is a science fiction novel describing the Martian invasion of England, in the late Victorian era, using tripod-legged fighting machines equipped with heat-ray and chemical weapons to subdue the Earth.